A Little Free Library made from a newspaper box in Seattle. Photo by Josh Larios. Lots of stories have been popping up lately about the Little Free Library movement. Back in March, Lane Wilkinson wrote a blog post on Sense and Reference about what institutional libraries can learn from these DIY libraries. More recently, my dad shared an article from the Atlanta Journal-Constitution about Little Free Libraries in the Atlanta area. I first stumbled across a DIY library in a park in Madrid about 10 years ago. Unfortunately, I didn’t take a picture of it, but it was a small stone structure with a shelf for books. Earlier this week, BBC News posted an article about a rather large free library run out of a man’s house in Manila. Clearly, in the Manila case, the DIY library is helping to fulfill a need that is not filled by institutions. Altanta is a very different case, though. Are DIY libraries popping up there because the public library system isn’t fulfilling people’s needs? Or are people just looking for something more local and more social than their local branch library? Or, perhaps, do people harbor a secret desire to be librarians? One thing is clear: people like to share books. This is so over-the-top I almost wonder if Kanye is putting us on. Fortunately, Cake Wrecks has come to my rescue with a fabulous collection of book-related cakes. Mmm, cake. Cake wins, no question. It always does, unless it goes up against pie, and then pie wins. Inspired by a book pocket posting at librarian.net, I took a photo of the inside back cover of a book from my library. 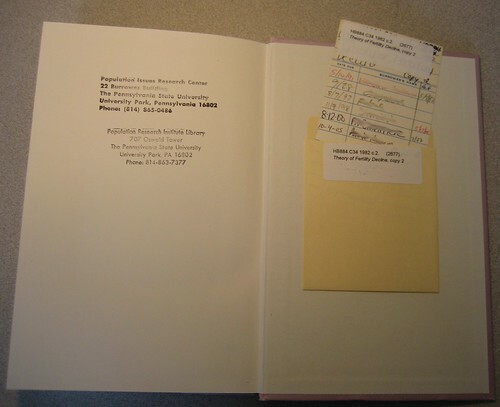 Because we still use a card checkout system, you can get quite a bit of information about the book, and about our library, from this photo. You can tell that the library moved from one building to another. You can tell that we own (or owned at some point) multiple copies of this book. You can tell how many times it has circulated, and when. You can tell that we reuse book cards. On the latest episode of the Chronicle of Higher Education‘s Tech Therapy, Scott Carlson and Warren Arbogast discuss the future of library buildings. They begin the discussion talking about Goucher College’s new library building, which will include a restaurant, art gallery, and treadmills. They talk about the library as a social place, the academic symbolism of books, and the possibility of the bookless library. I always find it amusing that a library building that includes nourishment for the body and the spirit as well as the mind is seen as something new. I used to work in one of the original Carnegie libraries near Pittsburgh, and the building includes an athletic club and a concert hall. The athletic club includes a pool, and formerly a bowling alley too. The library opened in 1898. Part of what has always appealed to me about libraries is their role as community spaces. It seems particularly easy to use public libraries as examples, but good corporate, academic, and other libraries play community roles as well. Ron Charles, a book critic for the Washington Post, has become disenchanted with Harry Potter – both the books and the cultural phenomenon. I see a lot of parallels between book critics and librarians in this article. Charles writes about being told, “Imagine being able to sit around all day just reading novels!” He laments the fact that fewer American adults are reading novels, and very few are reading anything but bestsellers. He worries about the future of his profession, with dwindling newspaper book review sections. He wonders whether the “long tail” will ever really appear. On ACRLog, Marc Meola points to a discussion of tags vs. subject headings at Thing-ology, Library Thing’s blog. The discussion is interesting, and not just because it seems to come to the same conclusion that I did (that both tags and subject headings are useful and interesting, and that an ideal system can make use of both). I find it interesting because it involves, as far as I can tell, both librarians and non-librarians. After all, we certainly don’t have a monopoly on classification (think of biology!) or on a love for books (first lesson in library school: when you go to an interview, the answer to “why do you want to work in a library?” is not “because I love books!”). We are trained specialists in the organization, preservation, and retrieval of information including books, and we can certainly learn from others with similar interests, including our patrons. They’re great cheap fodder for film studies, understanding the culture, and—well—making fun of the bad’uns. CD has already done this for less mainstream music. And what about books? The (paper) format is already perfect—I expect electronic formats will make rare books and special collections more accessible, but I don’t want to do my reading for pleasure on a screen. The big bookstores don’t typically stock things that they don’t expect to sell, but libraries keep them. Amazon and other online booksellers can stock all kinds of bizarre titles, and online used booksellers have made tracking down out-of-print titles much easier. Truly, life is getting better for those who appreciate the cultural fringes. A post on altered books over at Library Stuff reminded me of a book I recently checked out of the library. A previous reader really went at it with a purple highlighter. Fortunately, the copious notes are mostly scribbled on Post-It notes, which appear on almost every other page. I’m building a collection of them inside the back cover. Sometimes particularly important notes (or notes perhaps written during a Post-It note shortage) appear in the margins. One reminds the reader the Miss Smith, introduced mere pages earlier, is the consulate at the American embassy. This saved me the trouble of turning back a few pages, where the entire conversation with Miss Smith has been colored like an Easter egg.